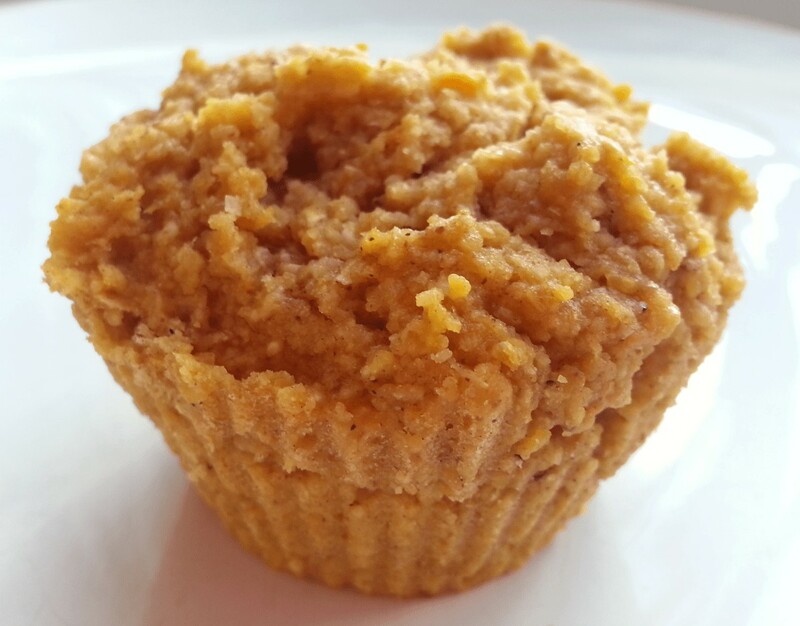 I was researching recipes for people with egg allergies at an old job when I found one for sweet potato cornbread. It sounded good, so I printed it out and tried it at home. I loved it except for the fact that I could taste the baking powder, which was used in large quantities to make up for the lack of eggs. Since I’m not allergic to eggs, I ended up changing the recipe to include eggs and I liked the results a lot better. Over the years, I’ve made so many other changes to the recipe that it’s not really recognizable from the original anymore, but it still tastes absolutely wonderful. It’s moist and not too sweet. Best of all, it’s the kind of muffin that tastes great right out of the oven – so you can start stuffing your face without waiting for them to cool down completely. These muffins don’t rise as much as others I’ve made, so you don’t have to leave much space at the top for expansion when filling the muffin tin. I use whole grain cornmeal. A lot of the cornmeal you can get in the supermarket has the outer hull removed before grinding, which makes it a refined product. If you can’t find whole grain cornmeal, it’s okay to substitute refined cornmeal. It’s up to you whether you want to use white, yellow, or blue cornmeal. I used yellow in the muffin pictured above. Sorghum molasses is not the same as blackstrap molasses or unsulphured molasses. Blackstrap molasses and unsulphured molasses are made from sugar cane, while sorghum molasses is made from the sorghum plant. They have the same amount of sugar, but sorghum molasses has a milder flavor that I prefer. If you can’t find sorghum molasses, you can substitute brown sugar, maple syrup or honey. I make tons of apple butter, so I always have some on hand. If you don’t, you can substitute applesauce, mashed sweet potato or the sweetener of your choice. A quick way to cook a large sweet potato is to nuke it in the microwave on high for 6 or 7 minutes. Let it cool a bit, then scoop the flesh from the skin. I don’t eat the skins, but my cat loves them. (Sweet potatoes are fine for cats in moderation.) She would eat the entire skin at once if I let her, but I try to limit her to a quarter of a skin at a time. She sometimes runs around the house with it in her mouth like it’s a mouse she’s just killed. Oh, the joy of being a cat. Mix the dry ingredients together in a small mixing bowl. In a large mixing bowl, cream together the coconut oil, sugar or xylitol, molasses, apple butter, and orange extract. Add the mashed sweet potatoes and beat with an electric mixer until smooth. Mix in eggs, then yogurt until smooth. Mix in dry ingredients until well moistened. Use spoons to drop batter into muffin tin with 12 2 ½-inch cups. Do not overfill. Bake 17 minutes at 350 degrees, or until toothpick inserted in center of muffin comes out clean. Cool on racks for 10 minutes.